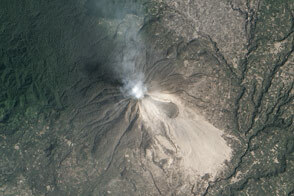 Indonesia’s Mount Sinabung has been sporadically active since 2010, following four centuries of quiet. 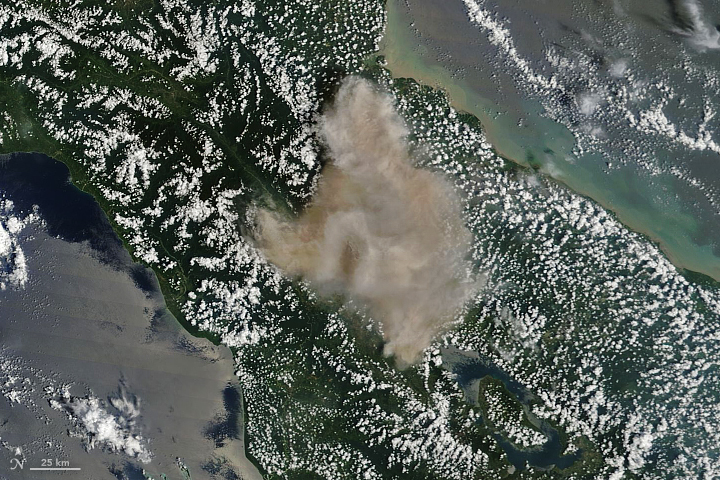 On February 19, 2018, the stratovolcano on the island of Sumatra erupted violently, spewing ash at least 5 to 7 kilometers (16,000 to 23,000 feet) into the air over Indonesia. 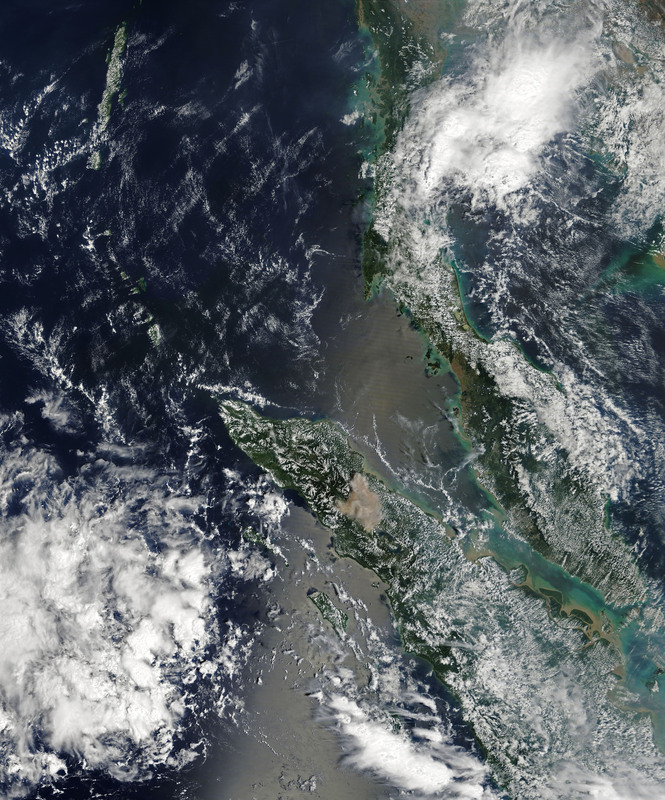 At 11:10 a.m. local time (04:10 Universal Time) on February 19, the Moderate Resolution Imaging Spectroradiometer (MODIS) on NASA’s Terra satellite captured a natural-color image of the eruption, just a few hours after it began. According to reporting from the Associated Press, the erupting lava dome obliterated a chunk of the peak as it erupted. 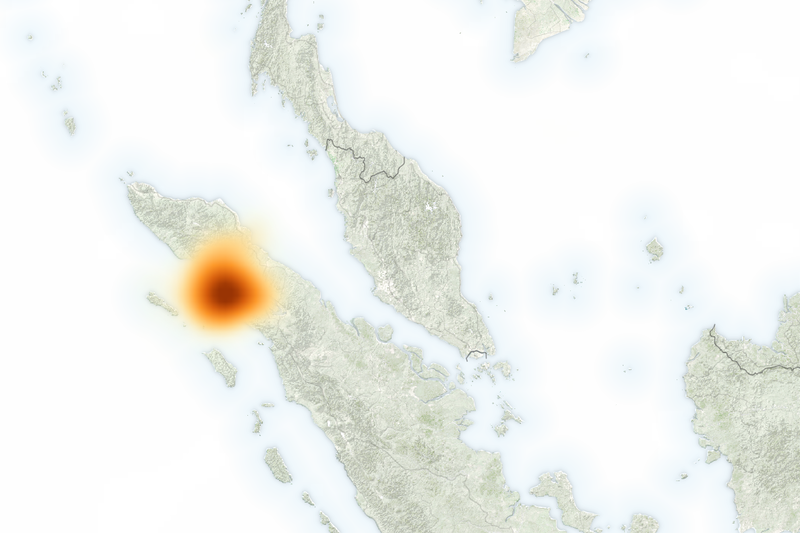 Plumes of hot gas and ash rode down the volcano’s summit and spread out in a 5-kilometer (3 mile) diameter, while ash falls were recorded as far away as the town of Lhokseumawe, some 260 kilometers (160 miles) to the north. 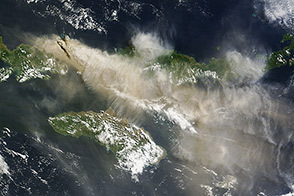 The volcanic plume also contained sulfur dioxide (SO2), which can irritate the human nose and throat when breathed in. 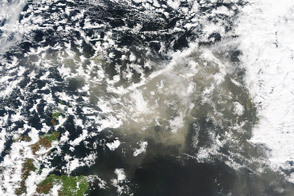 The gas reacts with water vapor in the atmosphere to produce acid rain, and it also can react with other gases to form aerosol particles that cause haze and, in extreme events, climate cooling. 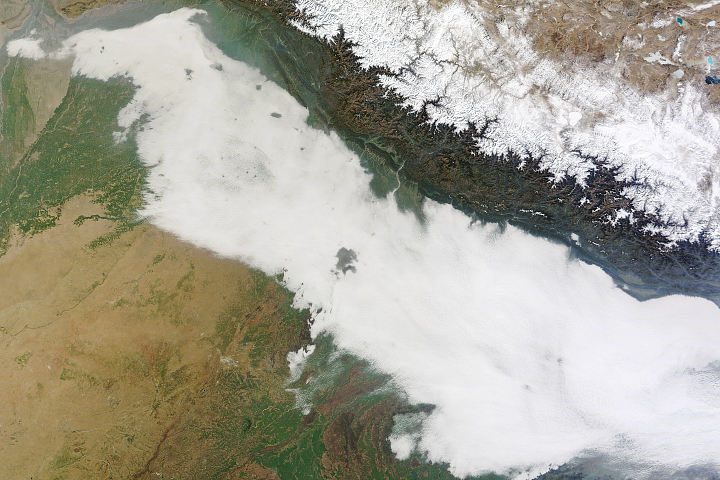 The map above shows concentrations of SO2 as detected at 1:20 p.m. local time (06:20 Universal Time) on February 19 by the Ozone Mapper Profiler Suite (OMPS) on the Suomi-NPP satellite. Maximum gas concentrations reached 140 Dobson Units. 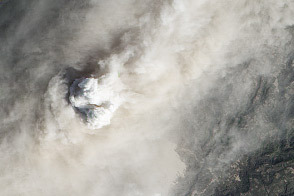 Other sensors on NASA satellites have also been monitoring Sinabung. 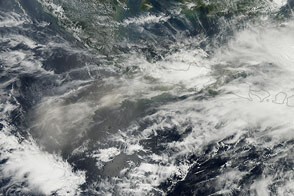 According to data from CALIPSO, some debris and gas from the eruption appear to have risen 15 to 18 kilometers in the atmosphere. 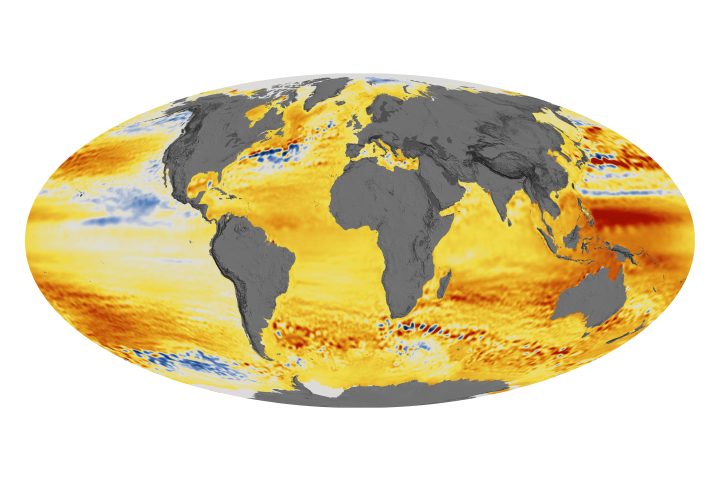 (Click here and look at the data near 3° North and 98° East.) Volcanologist Simon Carn of Michigan Tech also noted via Twitter that the OMI instrument on the Aura satellite had recently detected rising SO2 emissions around Sinabung, a sign that fresh magma was approaching the surface. Click here to see video of the dramatic first moments of the eruption. NASA Earth Observatory images by Joshua Stevens, using OMPS data from the Goddard Earth Sciences Data and Information Services Center (GES DISC), and MODIS data from LANCE/EOSDIS Rapid Response. Story by Mike Carlowicz. 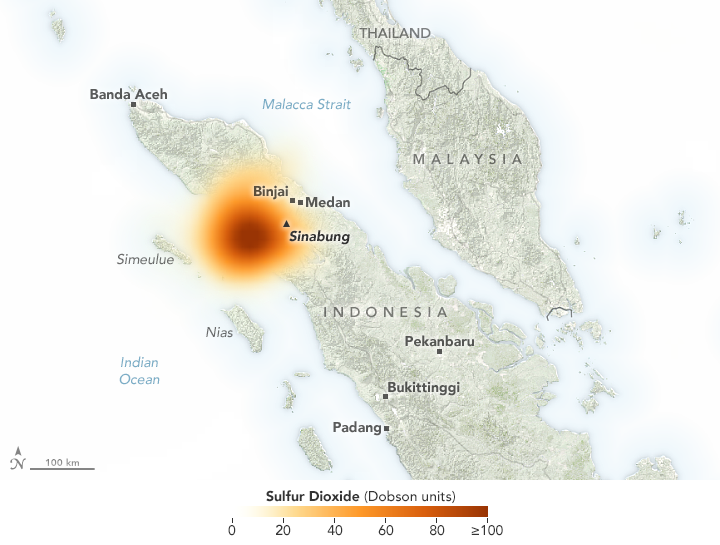 The Indonesian volcano blew a chunk of its peak into the sky, dropping ash across tens of kilometers and sending up a sulfur dioxide plume. Agence France-Presse, via The Jakarta Post (2018, February 19) Mt. Sinabung spews massive smoke-and-ash column. Accessed February 20, 2018. Associated Press (2018, February 20) Volcanic blast reshaped summit of Indonesia’s Mount Sinabung. Accessed February 20, 2018. 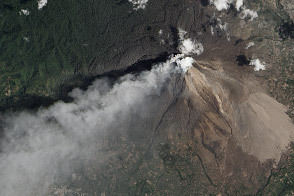 NASA Earth Observatory (2014) Eruption of Sinabung Volcano, Indonesia. Reuters (2018, February 20) Mount Sinabung Erupts. Accessed February 20, 2018. 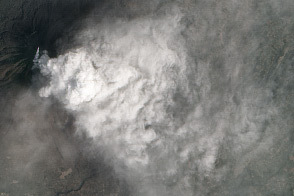 Rocky Planet, via Discover (2018, February 19) Sinabung’s Massive Explosion Seen from Space. Accessed February 20, 2018. Rocky Planet, via Discover (2018, February 18) Sinabung in Indonesia Produces Largest Explosion Yet. Accessed February 20, 2018. Smithsonian Global Volcanism Program (2018) Sinabung. Accessed February 20, 2018.